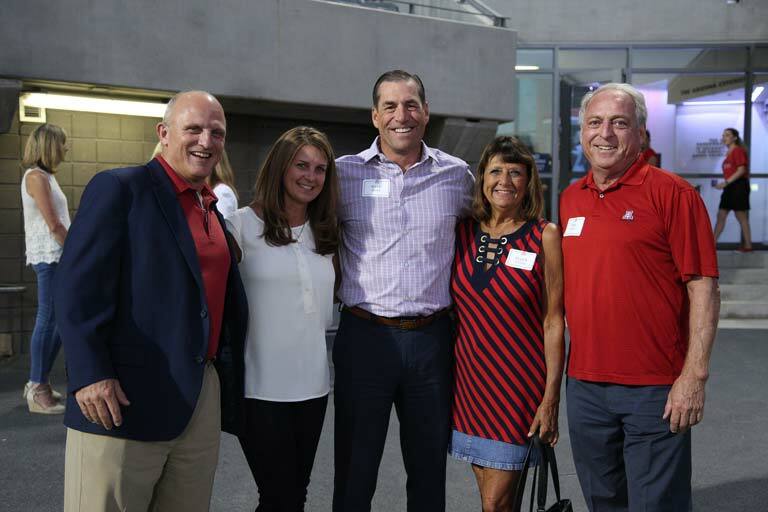 On Tuesday, September 25, members of our Student-Athlete Advisory Committee (SAAC), along with letterwinner Frank Youdelman ’77 (Rifle), called Arizona letterwinners who are also Wildcat Club members to thank them for giving back. Our student-athletes recognize that they wouldn’t have the experiences they do without donor support, and they were very enthused to have the opportunity to personally express their thanks. 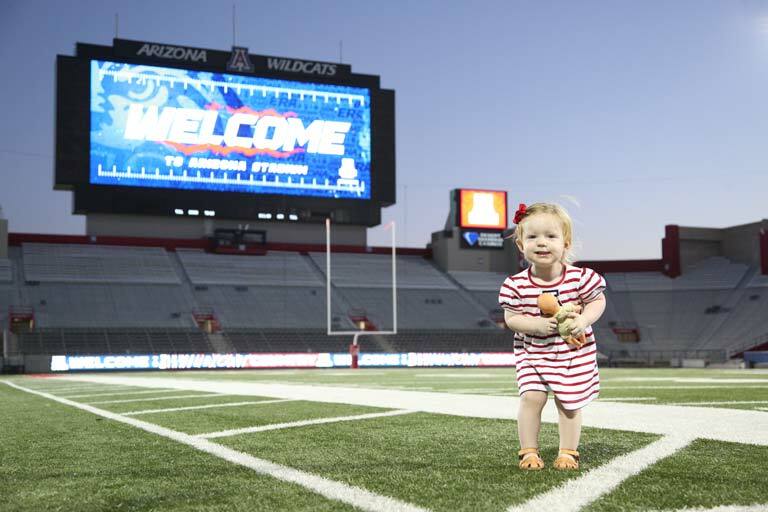 From all of us at Arizona Athletics, we thank you for your continued support! 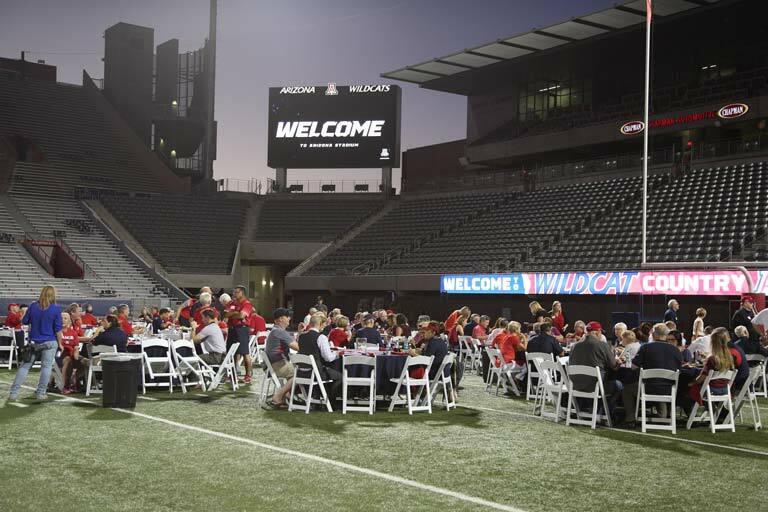 On Thursday, September 13, Wildcat Club members at the Button Salmon level and above joined us for a reception on the field at Arizona Stadium to kick off the start of the 2018-19 year. Arizona Athletic Director Dave Heeke and Executive Senior Associate Athletic Director Erika Barnes took a moment to thank everyone for coming, share their excitement for the upcoming year, and celebrate the progress of our ongoing 4+1 projects. 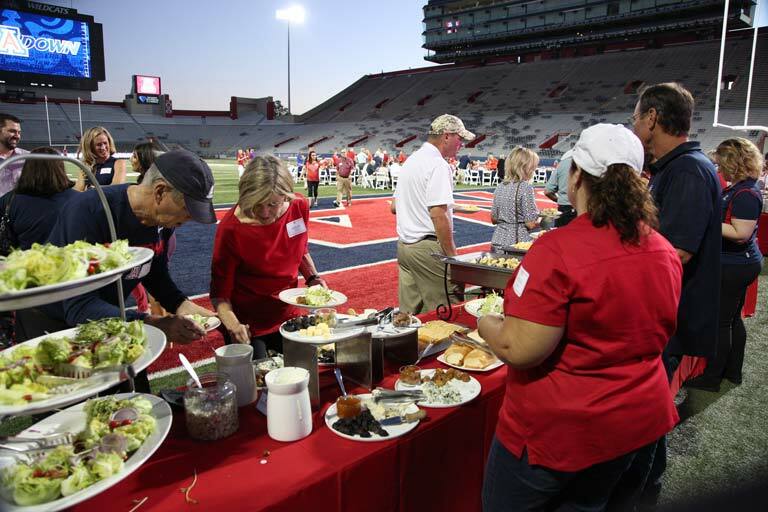 Following the reception, attendees had a chance to explore the newly renovated Zona Zoo. What’s your favorite memory of/at Arizona? I have a two-part answer. First, in 1997, I watched the Arizona Men’s Basketball team play during March Madness and then go on to win the 1997 NCAA Division 1 Men’s Basketball Championship and I thought to myself “Wow, look at the support that university gets!” A year later a position opened up and how exciting of a place this would be to work for was definitely in my mind. Part two would have to be the accomplishments of the 2002 Gymnastics team. 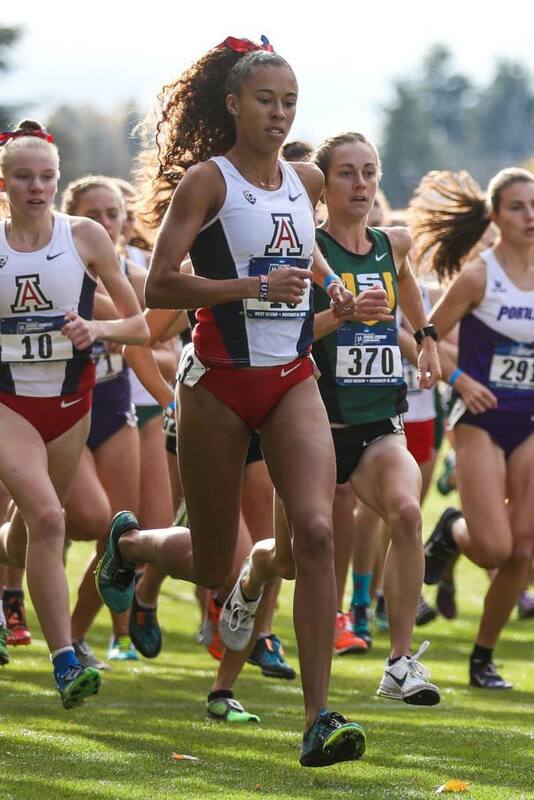 Finishing in second place at the Pac-12 (then Pac-10) Championships was incredibly rewarding. It’s also nice to have been here for twenty years and see athletes graduate and go out into the world and make a difference. There’s no award that can match that. Working with the athletes outshines anything. When did you realize you wanted to become a coach? When I was in grad school. I was an assistant coach and I found it to be very rewarding. It became a calling for me. I wasn’t shuffling papers, I could see the results from the efforts I put in, which I liked. I enjoyed working with athletes. They affected my life and I affected theirs. Coaching came very naturally to me. It didn’t feel like work and I was lucky enough to make a career of it. I’ve been very blessed. If you weren’t a coach, what career would you have pursued? Probably something in marketing—that’s what my bachelor’s degree is in. I actually considered trading on Wall Street when I was an undergrad. What’s the most rewarding part of coaching? We get to change people’s lives. We meet our athletes when they are 14 usually, and we have a relationship with them until they’re 22…that’s quite a long time. To be able to connect with so many people over the years is so special. And not only do you connect with the athlete, you connect with their family. Even after our athletes leave, those relationships continue. When we travel for competition to states where we have former Gymcats, we try to meet up. And Homecoming is always fun! Once a Gymcat, always a Gymcat. What’s your favorite thing about Tucson? What are you most excited about for the upcoming season? We made a lot of changes in the offseason. 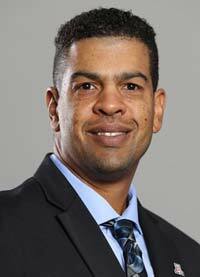 This will be my first season as head coach (not interim), and now I get to take the goals of the department and the University and combine them with mine and my staff’s and go from there. It’s not about wins or losses, the first competition is within ourselves. Winning inside that locker room, connecting better, supporting and trusting one another…that’s teammate to teammate, coach to coach, coach to athlete. That’s something we’ve been working on—connecting more with our athletes and changing the culture. We’ve seen a such strong commitment from our athletes and we want them to feel their opinions matter. We instituted a leadership council instead of team captains and the leadership changes every month. We talk about any issues, milestones we are trying to hit, how practice is going, community service efforts…. Then the council takes that information and shares it with the rest of the team. It gives them a chance to be leaders. We have a lot of new athletes competing who have never been in the spotlight. About half of our team hasn’t saluted a judge in college before, so as a coaching staff we are really looking forward to witnessing that. What’s something our donor/fan base doesn’t know about you? I lived in Vermont for five years and I still can’t ski! Work life balance is so important. You have to disconnect, as hard as that can be. I enjoy Tucson, I spend time with my friends, I go downtown, I play golf, I travel. I try to get near water/a beach as often I can. What kind of impact do Wildcat Club members have on gymnastics? Donors are very important to the success of Gymnastics. Gymnastics equipment can be pretty expensive so having that support is essential. There are so many ways to support Arizona Athletics as a whole. You can buy football tickets, you can give directly to a sport, it all counts, it all matters. We have some donors who have been supporting Gymnastics specifically for years and years, through our ups and downs, and knowing they want to help us build a great program means a great deal. Not only does donors support help our current team, it helps with future teams. For example, the locker room renovations—prospective athletes coming in notice those things and the better the facility we have, the more we have to offer. What is your favorite memory as an Arizona athlete? Earning All-American honors at last year’s NCAA Division 1 Cross Country Championships. I wasn’t originally recruited to run cross country, I was recruited to be a middle distance runner for the Track & Field team. It was a big surprise to everyone when I qualified. My goal going in was to place in the Top 40, so to place in the Top 25 was beyond my wildest dreams. During the race I was getting so much support from everyone back in Tucson and knowing that made the moment even more special. When did you first take up running and when did you realize you were good at it? I first took up running freshman year of high school. Growing up I was a swimmer, I swam for 15 years, and I also played volleyball. I had planned to play volleyball in high school, however, both of my parents ran in college and my mom was the high school cross country coach, so they convinced me to go out for summer running. After I returned from cross country camp, I knew that’s what I wanted to do. I thought I would run cross country and play club volleyball, but by the time I got to the end of the cross country season, it’s all I wanted to do! What are you studying and what made you select the program? I’m studying marketing. I started as an education major then I was a public management and policy major. I’ve always wanted to work for a non-profit, and I also wanted to have a major that was flexible and could be applied to a lot of different areas. Arizona has a stellar has a business school so I thought marketing would be a great way to go. You graduate in December—what are your plans after college? After I graduate I’m going to continue my running career. My plan is to focus the next five years on running. I’m hoping to work in a sports related field. Eventually I’d love to get into brand marketing before transitioning into non-profits. What do you enjoy most about being a cross country volunteer assistant coach? The opportunity to learn about the sport from a completely different perspective. When I’m at practices, I notice details now that I didn’t as an athlete. Especially the importance of how a team is working together and how that translates to how they perform during races. Personally, I think I’ll be able to apply what I’m learning as a coach to my own training and competitions once the season is over. I also love it because it gives me an opportunity to still be a part of the team—Arizona has been my family for the last four years. Interestingly, I get just as nervous for races as a coach as I did as an athlete! What does being a Wildcat mean to you? It means having the best fan base in the country. 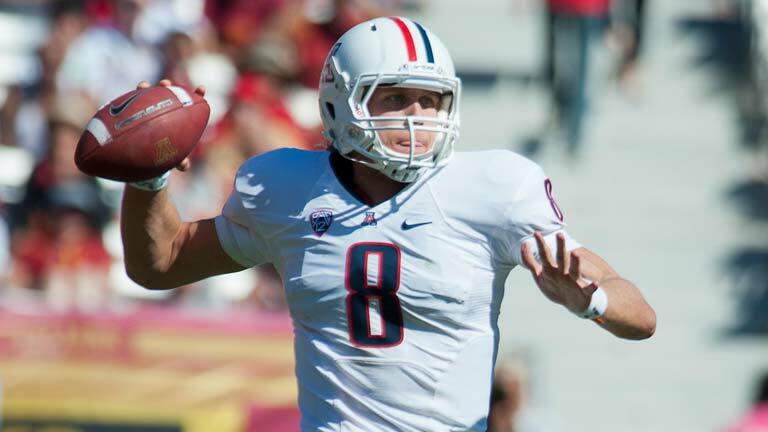 The best thing about being an Arizona Wildcat means knowing you have support coming from everywhere. I’ve been in Tokyo wearing an Arizona shirt and gotten a “Bear Down!” Having that sense of comradery no matter where you go, especially as an athlete when you are competing, pumps you up and gives you such a great feeling. What kind of impact do Wildcat Club members have on your experience as an athlete? Being a part of a non-ticketed sport means we rely heavily on donations to the athletic department, and we are one of the most well-funded cross country and track/field programs in the Pac-12. Working as an intern with the Wildcat Club, I have a new appreciation for how much of a difference donors make. It’s incredible to know we have that support and it allows us to compete in a sport that we love. Every athlete at Arizona is so dedicated, and the fact that we have people who believe in what we are doing and want to support our endeavors means the world to us. Good news—we still have tickets remaining for the Arizona Men’s Basketball Red & Blue game! The game is scheduled for Sunday, October 14 at 12:00pm. Call the ticket office at (520) 621-CATS or click here to get your tickets before they sell out. Upper Level seats are only $7! 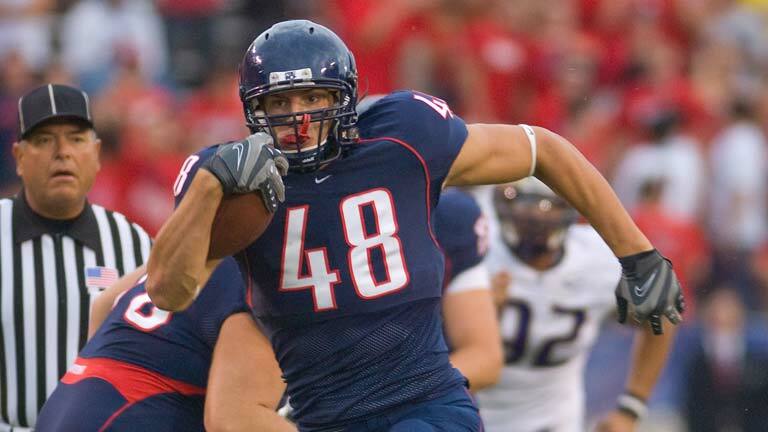 Did you know there are currently nine* former Wildcats in the NFL? Check out the list below!